Written by Irene Anton on January 15, 2019 . Posted in New publications. 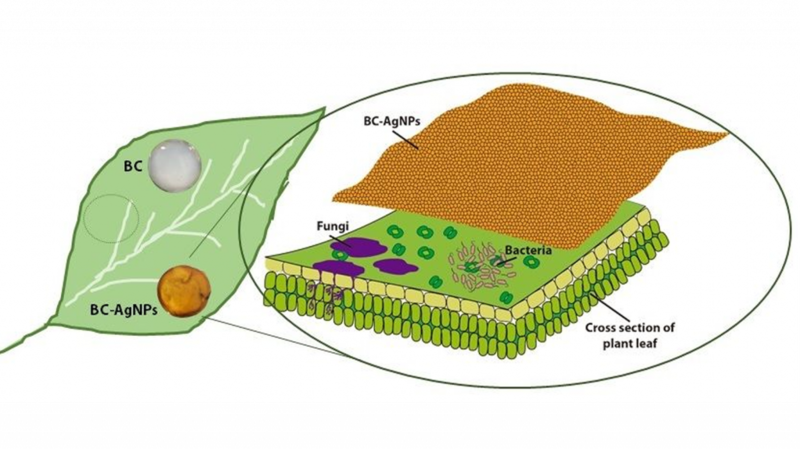 Last 11th January 2019 the paper “Enhancing the localized pesticide action through the plant foliage withsilver-cellulose hybrid patches” was published on the journal ACS Biomaterials Science & Engineering. This paper describes the collaborative work between the N&N group and the group of Núria Sánchez-Coll that works with bacterial pathogens and plant cell death at CRAG. Read this manuscript to gain insight about new methods to fight plant pathogens using bacterial cellulose patches! Abstract: Efficacy and efficiency of pesticide application in the field through the foliage still faces many challenges. There exists a mismatch between the hydrophobic character of the leaf and the active molecule, low dispersion of the pesticides on the leaves’ surface, runoff loss and rolling down of the active molecules to the field, decreasing their efficacy and increasing their accumulation to the soil. We produced bacterial cellulose-silver nanoparticles hybrid patches by in situ thermal reduction under microwave irradiation in a scalable manner and obtaining AgNPs strongly anchored to the BC. Those hybrids increase the interaction of the pesticide (AgNPs) with the foliage and avoids runoff loss and rolling down of the nanoparticles. The positive anti-bacterial and anti-fungal properties were assessed in vitro against the bacteria Escherichia coli and two agro-economically relevant pathogens: the bacterium Pseudomonas syringae and the fungus Botrytis cinerea. We showed in vivo inhibition of the infection in Nicotiana Benthamiana and tomato leaves, as proven by the suppression of the expression of defense molecular markers and reactive oxygen species production. The hydrogel-like character of the bacterial cellulose matrix increases the adherence to the foliage of the patches.